We've come through a slightly traumatic 4 days. For a week now, rumors were flying through the Internet about the demise of the beloved web magazine WOWInsider. For some of us, pretending we didn't know was our best defense. When the news was confirmed, thousands of people felt like they'd lost a good friend. So, I had this idea. 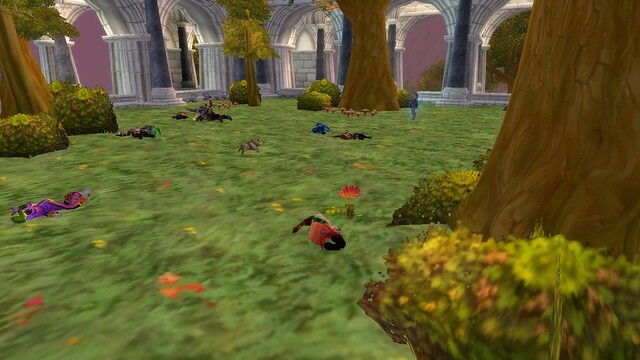 My guild, Spectacular Death, has been around a long time, since December of 2007. We have a unique perspective and focus on this game. We'll never be first into content, but we'll have the most fun when we do get there. What if we made a blog that discussed this game we all enjoy and that discussion was from the casual point of view? I took the idea to my guild and the enthusiasm is incredible. We're going to bring to our small corner of the WOW-verse, how the game works from a casual player's perspective. You can expect to see photos, including one for the highly popular "Throwback Thursday" theme. You can expect to see "Bug Reports", oh my, do we find bugs. You'll see "Suggestion Box"; some ideas we have for things we'd like to see added to the game. Favorite quest lines; suggestions for downing current tier bosses; a dissection of patches when the patches drop; we have lots of ideas. Everything we post will be for the benefit of and from the point of view of the casual raider. This will not be a blog about the exploits of Spectacular Death. If you want to know what we're doing, head over to our guild web site. We're going to be providing the casual raider tips, tricks, observations, rants and raves as we've found them within the game. There will be some overlap, we can't help it since current writers are from the guild, but our focus is not on what we're doing in SD. It's to be a resource to the person who has 3 hours one week to play; a spouse, a cat and a job; yet wants to have fun in this game. This blog is also a work in progress. Some days there will be quite a few posts, while some days, nothing. As we get this blogging idea down pat, you'll see more and more things, more steady columns, more familiar writers. Make sure you bookmark us. Finally, we had a floor tanking episode tonight.